Based on the abduction of 276 Nigerian girls by the Boko Haram in 2014, this book chronicles the captivity of those girls and the 57 girls who escaped when the terrorist group’s compound came under attack in 2016. Told in first person, short vignettes, the story of one girl, “Ya-Ta” (my daughter), stands as representative for several of the “daughters” who were kidnapped and escaped from the Boko Haram. Abducted, forced to either convert to Islam or be killed (and buried under the baobab tree), and then “married” to their captors, many of the girls do what is necessary to survive. It is the story of their survival that creates such a compelling read. Not all the girls merely survive; many are brainwashed into the thinking of their captors and participate in some of their terrorist acts. 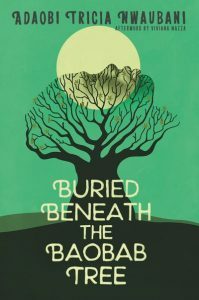 Buried Beneath the Baobab Tree is a riveting story that gives an inside view of the terrorist group plaguing the Borno area of Nigeria. Readers are first grounded in the context of life in the village of Chibok (the village from which the girls were abducted) as explained by several girls who were abducted and other primary sources. It is a life of hope and happiness with a vague concern about the Boko Haram. The narrator’s story is about a gifted girl who hopes to go to university and has just found out she has won a scholarship. Ya-Ta can follow her dreams! Those dreams are horribly thwarted, however, when she witnesses the destruction of her village and is taken forcibly from her home. Not only is this a chronicle that tells a compelling story with authentic details and characterization, it is a testimony to the resilience of those who lived through the harrowing and traumatic experiences while under the control of the Boko Haram. It also stands as a powerful indictment of the cruelty propagated by the Boko Haram and its perversion of the beauty of Islam. Two pieces of fiction that complement this text include The Red Pencil by Andrea Davis Pinkney (2015) and Lost Girl Found by Leah Bassoff and Laura DeLuca (2014), both of which give accounts of girls who show resilience in dire situations. Buried Beneath the Baobab Tree could also be included in a text set about young people who strive and survive. Books for this set could include Golden Boy by Tara Sullivan (2014), Escape from Aleppo by N.H. Senzai (2018), The Smell of Other People’s Houses by Bonnie-Sue Hitchcock (2017), Amal Unbound by Aisha Saeed (2018), A Land of Permanent Goodbyes by Atia Abawi (2018), and Harbor Me by Jacqueline Woodson (2018). Nwaubani worked with Italian journalist Vivianna Mazza on the research for this book. Together they traveled to the Borno region of Nigeria and interviewed those who could give an account of the events that occurred on April 14, 2014 and then the subsequent accounts of being held by the Boko Haram. Mazza wrote the afterward explaining the events that surround this fictionalized account. Adaobi Tricia Nwaubani is a Nigerian writer, essayist, and journalist who has won several awards for her writings. Born in Nigeria in 1976, she won her first writing competition at the age of 13 and has a column on the BBC website from the “Letter from Africa” section. Nwaubani lives in Abuja, Nigeria. Her other works include I Do Not Come to You by Chance (2009) as well as articles for the BBC, the New York Times, Al Jazeera, CNN, and Sunday Express among others. She also has several videos that detail some of the atrocities women and children face in parts of Nigeria and Africa, including one, “Beyond Boko Haram” (2017), which readers might find of interest. More information on Nwaubani can be found at: https://adaobitricia.com.